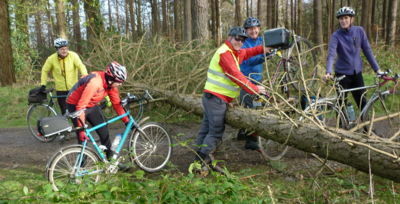 CTC Exeter bases its activities around group riding – it is a superbly enjoyable activity. New riders of all ages and experience are welcome to join our rides. The rides are fun, will help you to get fit, and are free. If you enjoy your first few rides, we’d like you to join the CTC - for insurance and liability reasons, regular riders are expected to be members. In addition, CTC Exeter also arranges weekends away, and, together with other affiliated clubs, participates in audaxes, and competitions. There are also sometimes informal activities arranged by members or just groups of friends, and many members also tour all over the world. Sunday Rides form the ‘core’ of our local riding. 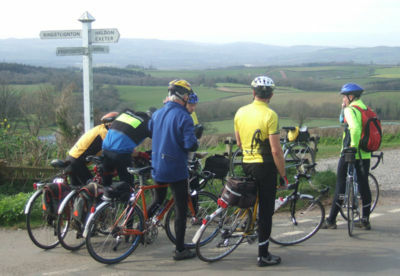 They usually start at 10.00 am at designated start points around Exeter, and are split into ‘A’ and ‘B’ rides. ‘A’ rides are defined as ‘longer and faster’, usually 35 to 60 miles long often with repeated climbing and steep hills. They require a good level of fitness. ‘B’ rides are ‘shorter and slower’, typically 25 to 40 miles over a day, with some hills and a relaxed pace. Sunday riders normally carry a picnic lunch. Wednesday Evening rides start from Exeter (Pinhoe) 7 pm, and/or Cranbrook, and head to a designated local pub for stories to be exchanged before returning directly home. Except in the summer, lights are needed for night riding. Thursday ‘Coffee Pots’. On Thursday mornings riders make their own way to a nominated cafe, normally between 10:30 and 11:30. There is also a ‘Bike Bus’ specifically to cater for, and help, those new to cycling. Bike Bus picks up riders en-route to a schedule which is also published on the website. Group Riding. Our group rides have a structure with a leader and usually a ‘back-marker’ or ‘sweeper’ if the number of riders needs one. Hills can be a problem to us all and sometimes our legs hurt! Don’t worry if you seem to be falling behind on a climb. We’ll ‘regroup’ where it’s safe and convenient, and, in any case, you will have the assistance of the ‘sweeper’ who will also help you if you have a problem with your bike. We also have a set of Group Riding Principles which we use on our group rides and which are on the website. There’s no need, initially, for newcomers to read pages of instructions - you will soon see how our group riding works out on the road, by example. Insurance. Our group rides are covered by CTC third-party insurance, so if you are new to our group, please make sure we have your contact details, so that you can be included in the insurance cover for the ride. Buddy. For novice riders who would like the help of someone experienced to guide them through their queries, CTC Exeter is happy to assign a ‘buddy’ to you. spare inner tube, and/or puncture repair kit. In winter you will need lights - we cannot guarantee you will be home before dark. This page was last edited on 4 November 2015, at 10:03.